The benefits of a college degree are well-established. Unemployment is consistently several percentage points lower for workers with a bachelor’s degree than it is for those whose education ended after high school, and over the course of a lifetime, college graduates earn hundreds of thousands more on average than their less-educated peers (even with the cost of college increasing in recent years). The largest benefit of a college degree, however, may be flexibility: college graduates are often able to choose from a number of careers, employers and places to live, which hugely benefits their overall quality of life. Unfortunately, that flexibility generally diminishes as time passes. Once they become homeowners and start families, college grads will find it harder and harder to switch careers or move to a different city. Which makes the years immediately following graduation the ideal time to try living in a new place. Thinking about college? Try our free student loan calculator. 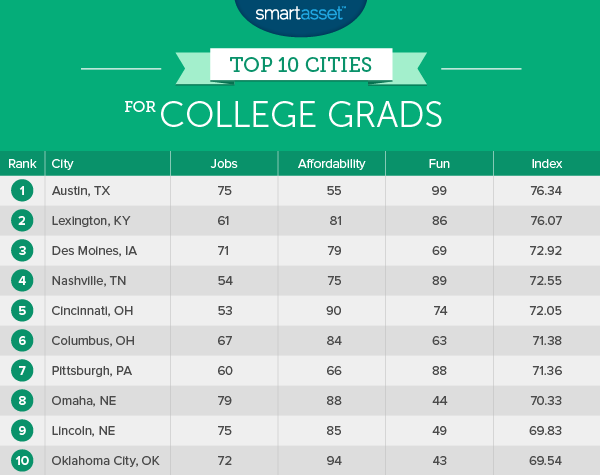 To find the best cities for college grads, SmartAsset looked at data on over 100 of the largest cities in the United States. For each of the cities in our study, we developed three separate scores, based on a total of ten metrics, covering the aspects of life most important to a recent college graduate: jobs, affordability and fun, described below. Jobs. Are there plenty of well-paying jobs for college grads in this city? To develop this score we looked at the unemployment rate for bachelor’s degree holders, along with overall unemployment, median income and the number of job openings for applicants with a bachelor’s degree on Indeed.com and Careerbuilder.com. Affordability. Can a (probably debt-laden) college grad afford to live in this place? We considered fair market rents, since most recent college grads would rather rent than buy, as well as the overall cost of living in this factor. Fun. Is there stuff to do in this place? We developed this score using data on the concentration of young people (ages 20-29) in each city, the concentration of entertainment establishments (like bowling alleys, casinos, theaters, etc. ), the concentration of bars and restaurants and the average Yelp star-rating of bars and restaurants. The Midwest and the South dominated the top ten, claiming either eight, nine or all ten of the top ten places (depending on how you categorize Austin, Oklahoma City and Pittsburgh). The main edge offered by the South and Midwest? Affordability. Of the 15 most affordable cities in our study just two were located outside of the South or Midwest. Five U.S. state capitals landed among the top ten cities for college grads. Politics have always proven attractive to new college grads, whose idealism, energy and education often make them the perfect fit for political positions like speechwriter, canvasser and policy analyst. It’s safe to say the Texas capital city’s secret is out. 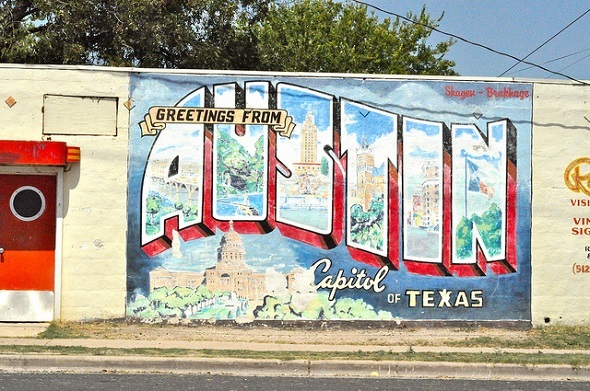 Austin is one of the fastest growing cities in the country, and a significant portion of that growth can be attributed to a young people migrating to Austin from all over the country. So why has it become such a magnet? First and foremost is the well-regarded cultural scene, which features some of the best entertainment and dining around—Austin bars and restaurants both ranked 4th out of any city in the country, and we don’t need to tell you about Austin’s legendary music scene. However, unlike other cultural capitals—looking at you New York and San Francisco—Austin isn’t prohibitively expensive. In fact, the city’s 93.8 composite cost of living score places it below the national average of 100. Combine that with the strong jobs market across the Longhorn state, and it’s easy to see why Austin is the perfect city for college grads. “The Horse Capital of the World,” Lexington is surrounded by more than 400 horse farms, which raise horses of all breeds and for all purposes—including, of course, racing. While any college grad can enjoy a day at the racetrack (Keeneland Race Course is the local favorite), there is plenty to do in town that doesn’t involve horses. Lexington has the 20th highest concentration of 20-somethings of any major U.S. city, and bars there rate ninth highest in the country on Yelp. The best part? All of that comes at a low cost: Rent in Lexington is fifth lowest of any major city in the country. While many may associate the state of Iowa with agriculture more than cosmopolitan city-life, a visit to Des Moines should put that misperception to rest. The Iowa state capital is a hub of commercial, cultural and political activity, a fact that is reflected in its strong jobs market. Des Moines has the 4th lowest unemployment rate for workers with at least a bachelor’s degree of any city in the country, and the ninth lowest unemployment rate overall. In his country hit “Crazy Town,” Jason Aldean described Nashville as “Hollywood with a touch of twang.” That may not be far off the mark. Nashville has the third highest concentration of entertainment and dining establishments of all major U.S. cities, behind only Los Angeles and San Francisco. Unlike those Californian metropolises, however, a recent college grad might actually be able to afford Nashville, which boasts a 91.2 cost of living index. In Nashville, you really might be able to “live off tips from a pickle jar,” as Mr. Aldean so eloquently put it. The first of two Ohio cities to crack the top ten, Cincinnati is home to America’s oldest professional baseball team (the Reds, originally called the Red Stockings), as well as the nation’s oldest reinforced concrete skyscraper, the Ingalls building, built in 1903. While there’s certainly plenty of history in Cincy, there are also hordes of young-people: according to data from the U.S. Census Bureau it has the 18th highest concentration of 20-somethings of any major US city—about 20% of Cincinnati’s citizens are in their 20s. As the home of Ohio State University, one of the largest universities in the country, Columbus greets a huge number of new college grads at the end of every school year, many of whom choose to stay put. With good reason: Columbus is the 11th most affordable big city in the US, with rent for a typical one bedroom apartment costing just $655, according to HUD. New arrivals should be prepared to don some silver and red come September, when nearly everyone in town will be rooting for the Buckeyes to repeat as college football’s national champions. Pittsburgh is the link between the Midwest and the Northeast, and the city combines the best of both these worlds. It offers the low cost housing common to Midwestern cities, alongside the high quality entertainment and dining of east coast locales like Boston, New York and Washington, D.C. It is also one of the youngest cities in the country: according to data from the U.S. Census Bureau, 23% of Pittsburgh’s population is in the 20-29 cohort, the fifth highest rate in the U.S.
College grads moving to Omaha should have no problem finding work. Omaha’s job market ranked fifth overall out of any city in our study, thanks to the third lowest unemployment rate for workers with a bachelor’s degree and the second lowest unemployment rate overall. Graduates with a degree in computer science and other tech-centric disciplines will find Omaha particularly welcome: SmartAsset’s 2014 study of tech jobs found that Omaha was the nation’s best city for tech workers. Just half a point behind Omaha, Lincoln has a similarly strong job market, with an unemployment rate under 3%, lowest of any major city in the country. Lincoln is home to the University of Nebraska, and the Cornhuskers are the main event on autumn Saturdays. New arrivals are encouraged to catch a Huskers game at Memorial Stadium, which has sold out every home football game since 1962. The capital of the Sooner State, Oklahoma City is a great place for college grads looking to experience a new city. It is the 4th most affordable city in our study, with average rent for a two bedroom apartment costing just $602, according to HUD. Newcomers should have no problem making friends: OKC is sometimes called “The Big Friendly” because the people are so welcoming and—you guessed it—friendly. As described above, we developed three 0-100 scores based on three separate categories of data—jobs, affordability and fun. We used the same methodology to create each score. First, we ranked each city on each the underlying metrics for the three scores. So, for example, to develop the “fun” score, we ranked every city on these four underlying metrics: the percent of the total population between the ages of 20 and 29, the number of entertainment and dining establishments per 10,000 residents, the average Yelp star-ratings of the city’s bars and the average Yelp star-ratings of the city’s restaurants (note that we gave half-weight to the two Yelp rankings—all other metrics in the study were given full weight). We then averaged those three rankings to come up with a final score. The higher the score, the better the city is for college grads. Here are the top five cities in each of the three categories we considered (in order from first to fifth). The “funnest” cities were: Seattle, Austin, San Francisco, New Orleans and Los Angeles. The most affordable cities were Fort Wayne, Buffalo, Lubbock, Oklahoma City and Laredo. The cities with the best jobs markets were Arlington, Virginia; Washington, D.C.; Madison, Wisconsin; Honolulu, Hawaii and Omaha, Nebraska. The data used to develop the affordability score came from the Department of Housing and Urban Development, and the Council for Community and Economic Research. The data used to develop the jobs score came from the US Census Bureau, the Bureau of Labor Statistics and the Indeed.com and CareerBuilder.com APIs. Finally, the data used to develop the fun score came from the U.S. Census Bureau and the Yelp API. Read the current version of SmartAsset’s study of the best cities for new college grads here.